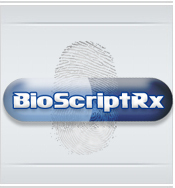 A unique prescription monitoring database software that operates upon biometric identifiers rather than generally identifiable patient information. Uniquely based upon the well-established reliability and security of electronic fingerprinting technology. Prescription monitoring programs are designed to prevent the diversion of lawful prescription medications through the unlawful practices of "doctor shopping" and prescription fraud. According to the National Alliance for Medical State Drug Laws (NAMSDL), 26 States have currently operational prescription monitoring program (PMP) for controlled substances and abused medications (As of 12/07).